No, it’s never easy in the semis of such a big event. This tournament was HER tournament, and I knew that even tired, even down in the 3rd, she would still fight. That she would never give up. So I’m so happy. 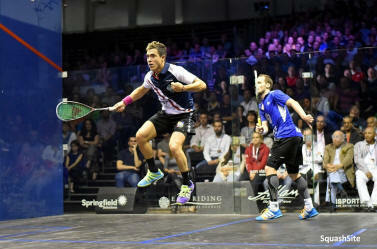 Tomorrow, whoever I’m playing, I’ going to enjoy it so much, the crowd is amazing, the venue is amazing, thank you soooo much. Camille was relaxed for the first time in the tournament it seemed to me. She was composed, calm, feisty and fit. 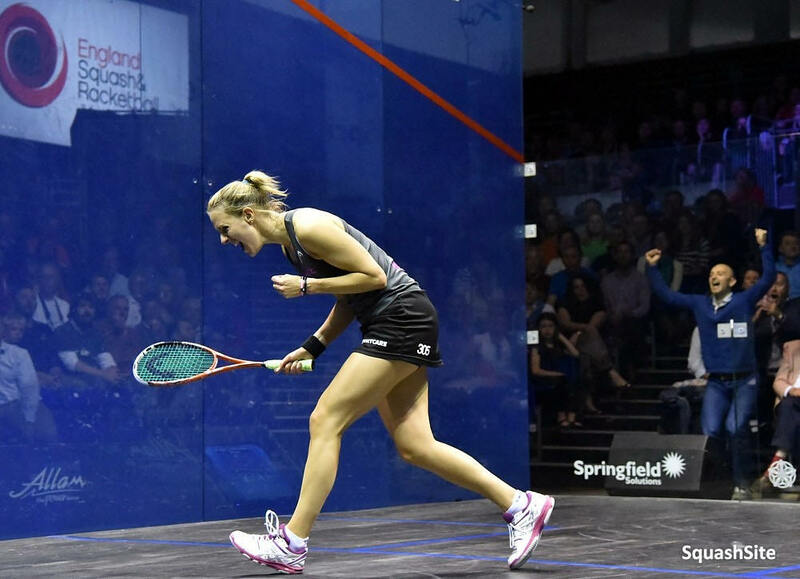 The English number one took a big risk by deciding to stop everything for a few weeks, and just rest until she was hungry for the game again. But it was a good choice it appears. 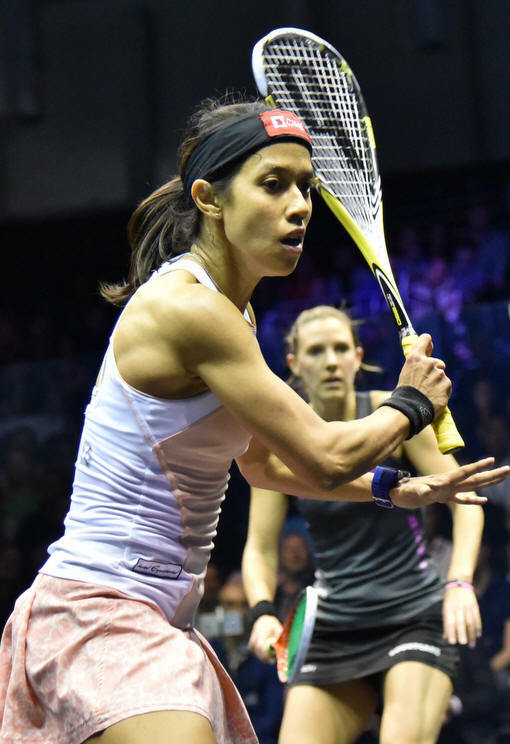 Downed easily in the first game 11/4, she came close to taking the second but lost it 11/9, and at 5/0 down in the third, it looked like Nicol was in the final. A huuuuuuuuuge scream at that point, and the Lady decided that she was not going to be ridiculed in front of a big crowd on her home turf. She scored seven points in a row, clinching that game on her third game ball, 11/9. 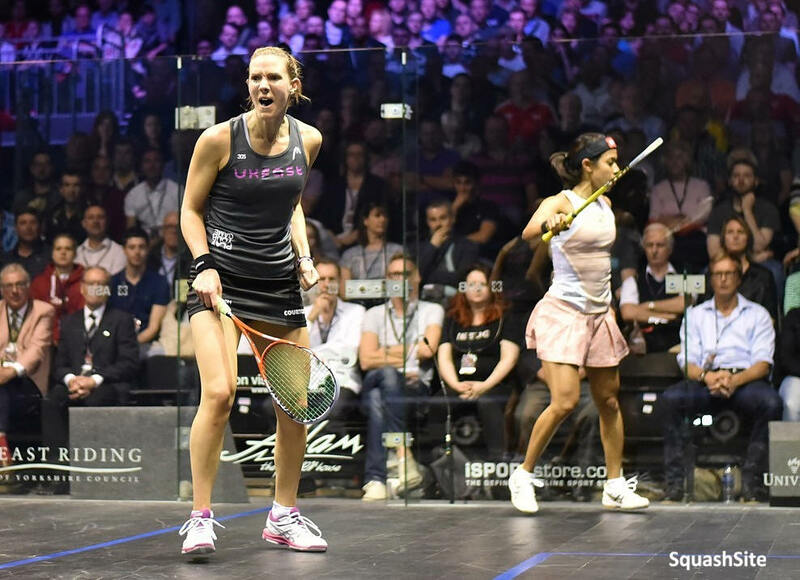 The fourth was just as huge a game, Nicol got a match ball at 10/9, but a “lucky nick” from Massaro denied the Malaysian, 10/10. 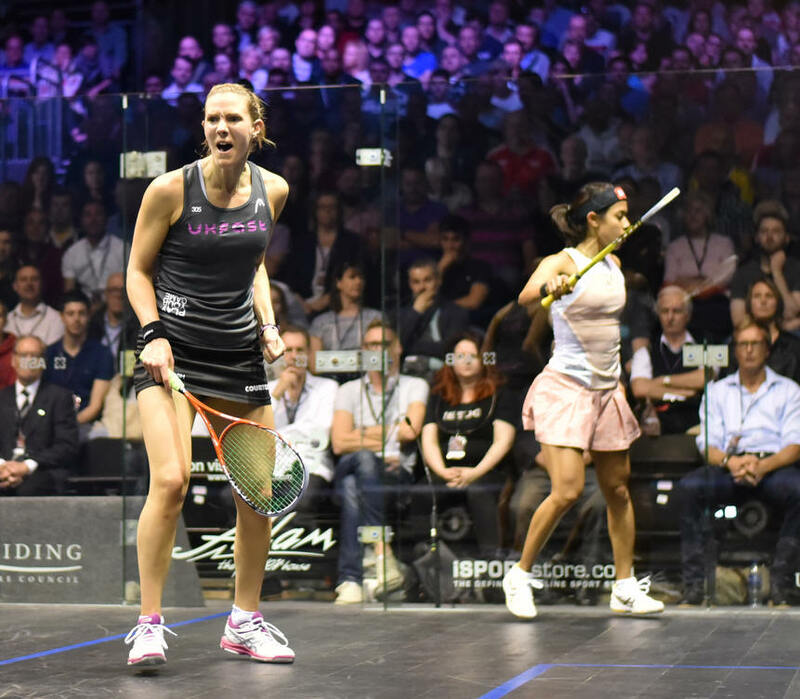 The English star took the next two points rapidly, 12/10 in 14m, two games all, a very noisy crowd replenishing Laura’s energy tank. 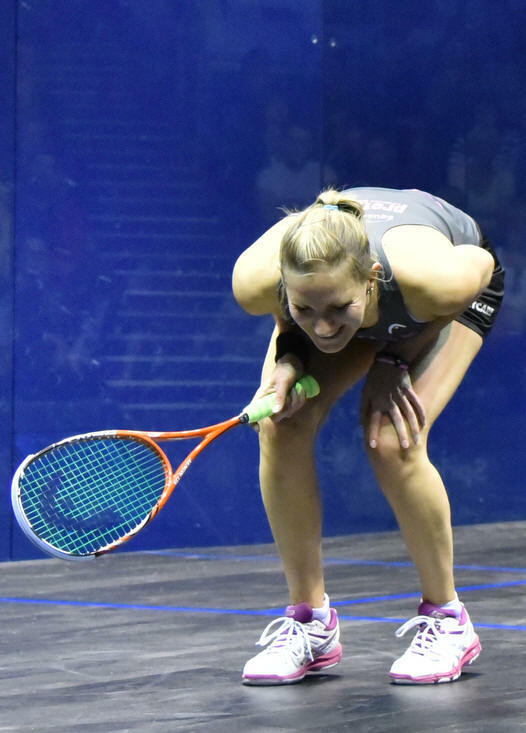 The fifth lasted 13m, Laura dominating the whole way, from 3/0, 4/2, 5/3, 6/4, then found a nice cushion at 8/5, 10/6, match ball, to finally book her place in the final for the third year in a row, 11/8 in 78m. I’m really pleased with that, I can’t tell enough how much the crowd helped me today, it’s such an advantage to play in front of your home crowd, and I hope they’ll be there tomorrow as well! 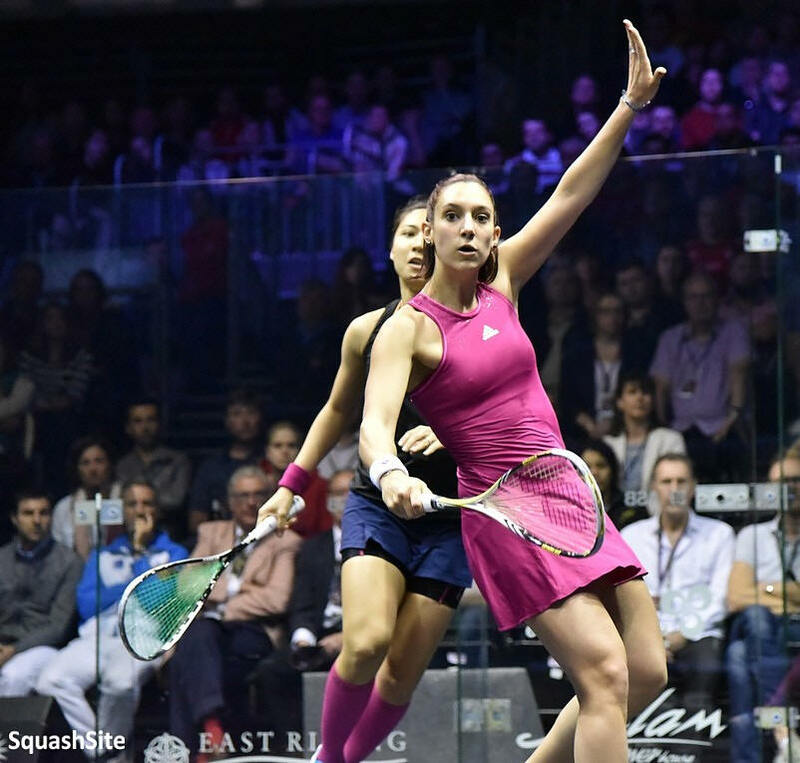 When I was 5/0, I thought oh no, it’s a nightmare, it’s the Commonwealth Games all over again, losing in front of my home crowd, and I just kept telling myself, DO NOT let her 11/0 you in that game. It was all about refusing to embarrass myself. And then I just calmed down, and settled down. I think I came on court trying having to prove something, but suddenly, I didn’t have anymore pressure on myself, I just wanted to enjoy the time on there. I never thought I “had” Nicol. She is such a champion, she is so fit, she never gives up. The only thing you can do is piling the pressure up. And even on match point, I was this is going to be a nightmare, I’m going to have to have to hit an outrageous shot to win this, and then she made that tin, it was such a gift, such a bonus. I am SO EXCITED!!!! 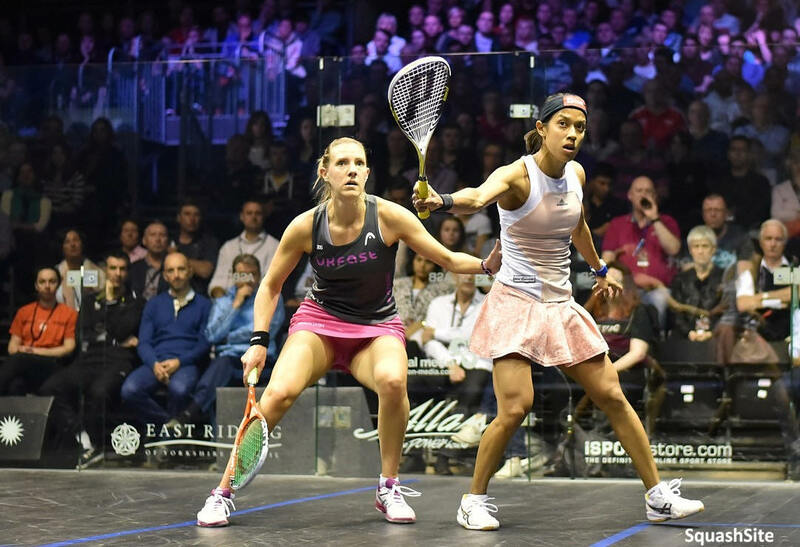 You don’t beat Nicol if you don’t play your best squash. My ranking dropped, so this was a big semi, we haven’t been playing in the semis for what, three years? 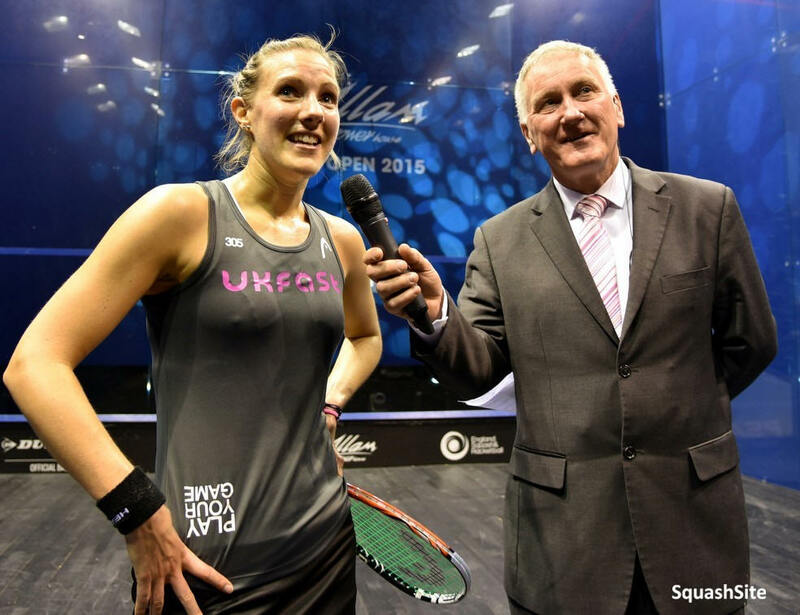 So this is huge… It means the world to me, with Allam supporting women squash and increasing the prize money, such a huge event at home, I really want to do the women’s game proud. 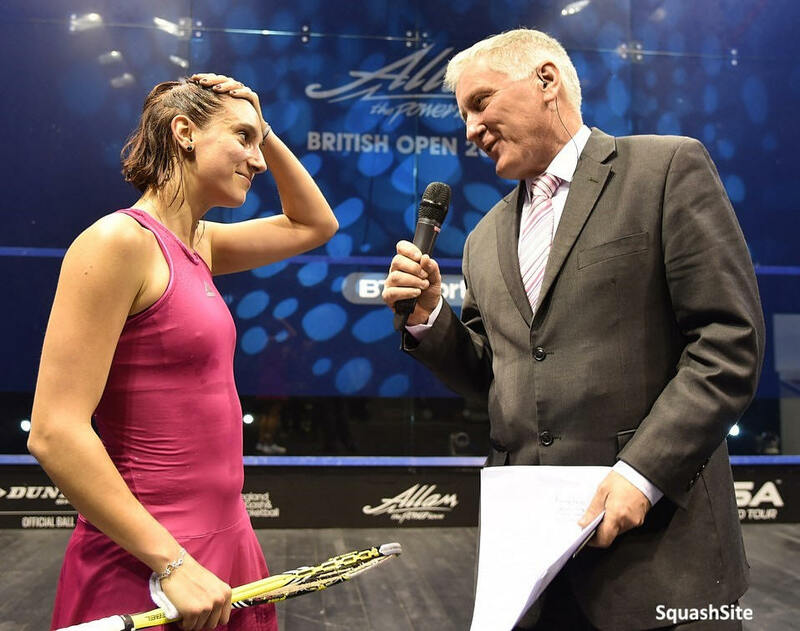 I have a bit of recovery to do, but I have the physio waiting in the wings, and I’m on home turf, I’m not "
Like I said yesterday, Nick had all the reasons not to get on court, and although he was getting better match after match, he was not playing his best squash, far from it. 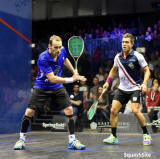 And still he managed to win and get to the semis. 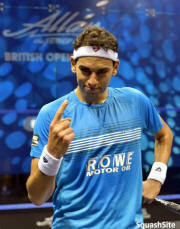 He proved once again the Champion he is, and only him could have managed to reach the semis with the way he was playing. Today, I just tried and contained him, had the job done, but only Nick could achieve what he has done this week. It was such an honour to play against Jahangir Khan, I was too little to see him play, but I wish I could have played against him, I probably wouldn’t have scored a single point! 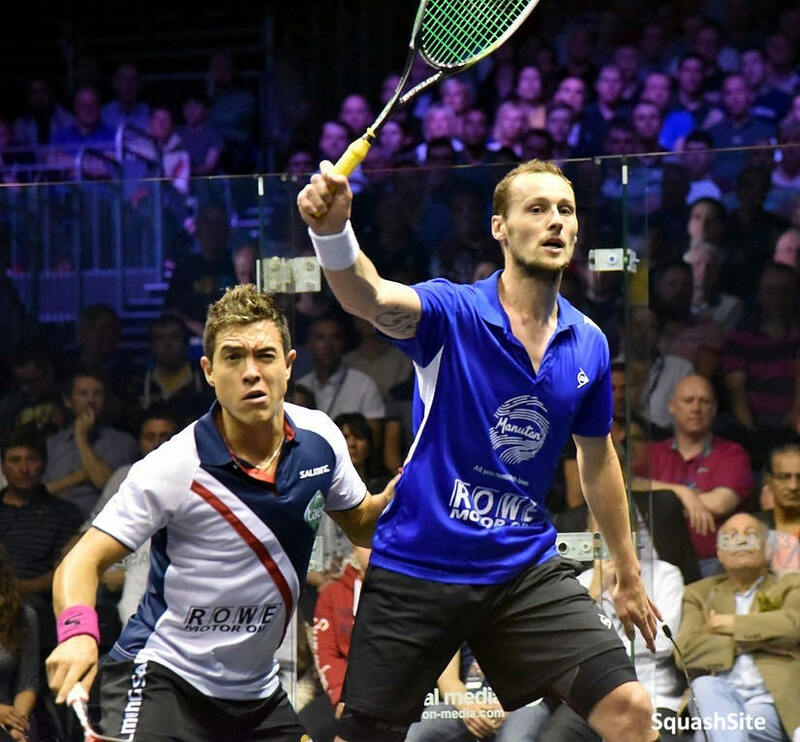 It’s my first final in the British Open, my own coach, Jonah Barrington, has won it six times, and I’m going to do my best to put my name on it, just once, that’s all what I’m asking. 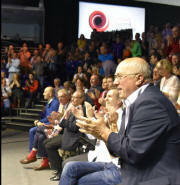 I am so happy I’m going to be able to play in front of that great English crowd. This country has been incredibly good to me, I moved here from Egypt when I was 14 years old, and they offered me a grant to study in Millfield for 3 years, then in Bristol Uni for another 6 years. I am so grateful to this country, and hopefully, tomorrow, the crowd will be on my side! 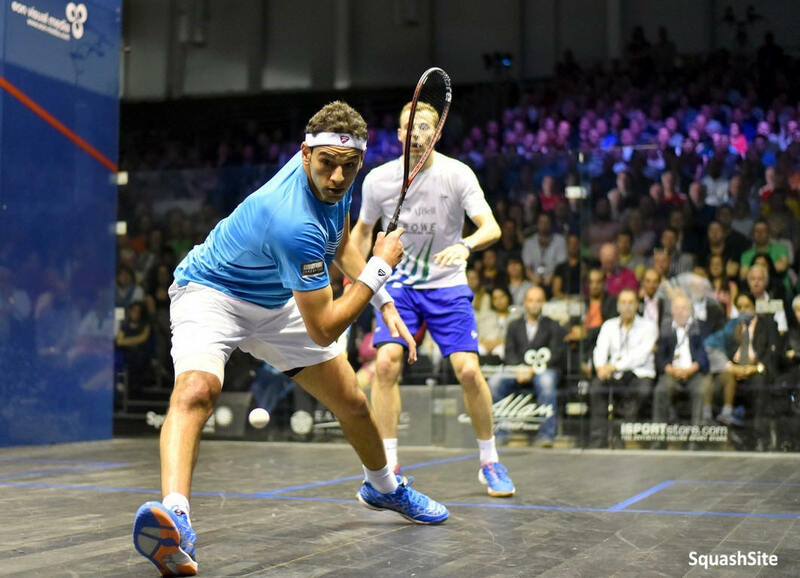 Although Mohamed hit a few loose shots in the first, he dominated the first game, 6/3, Nick came back close, 7/8, but Mohamed found some lovely winners at the end, 10/7 and took the game on his first game ball in 19m. 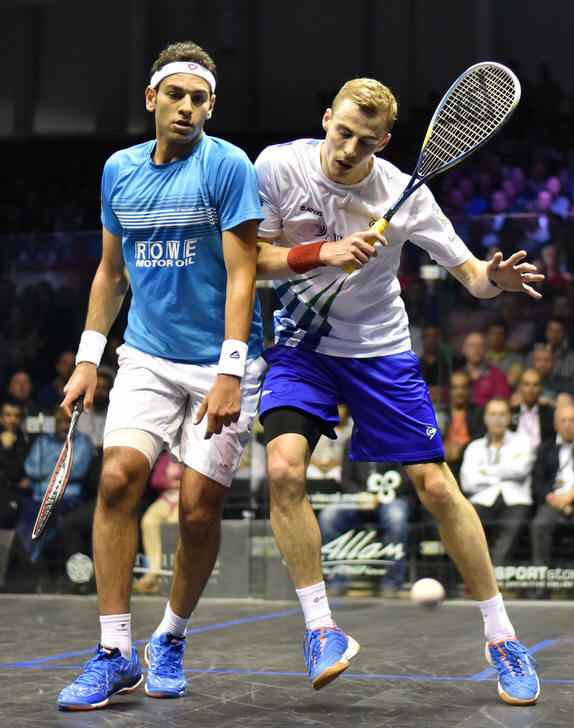 The second was similar, Mohamed up 6/3, Nick felt the danger, drew level at 6/6, but suddenly made uncharacteristic errors at the business end of the game, 11/7 Mohamed in 10m. 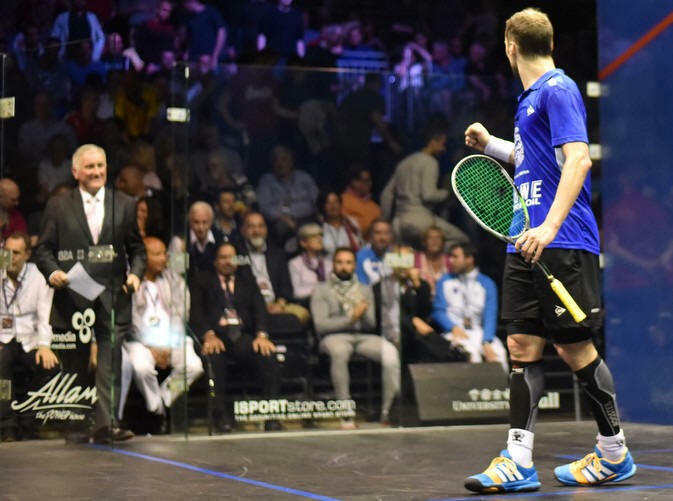 If Mohamed thought that was it, he was heavily mistaken, as Nick took the third quite comprehensively 11/5 in 8m to reduce the deficit. 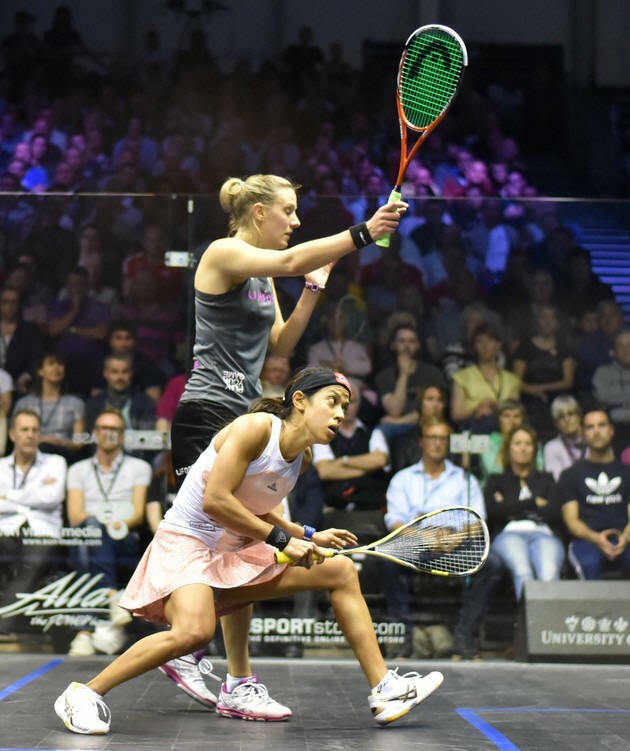 Was Nick going to be able to do a Laura Massaro style comeback? It wasn’t to be. 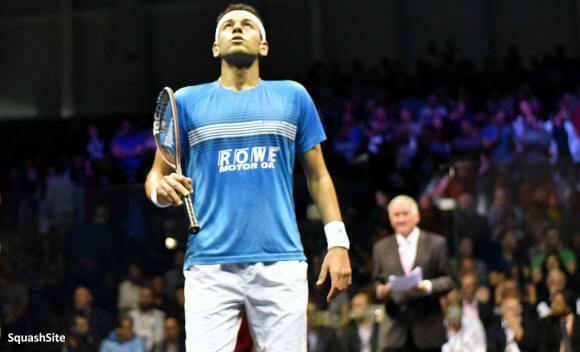 Mohamed, refreshed after the break, where his mum Basma was relaying to him what Jonah Barrington was texting her, just zoomed to 7/0, and took the match on his first attempt, 11/5 in 8m. 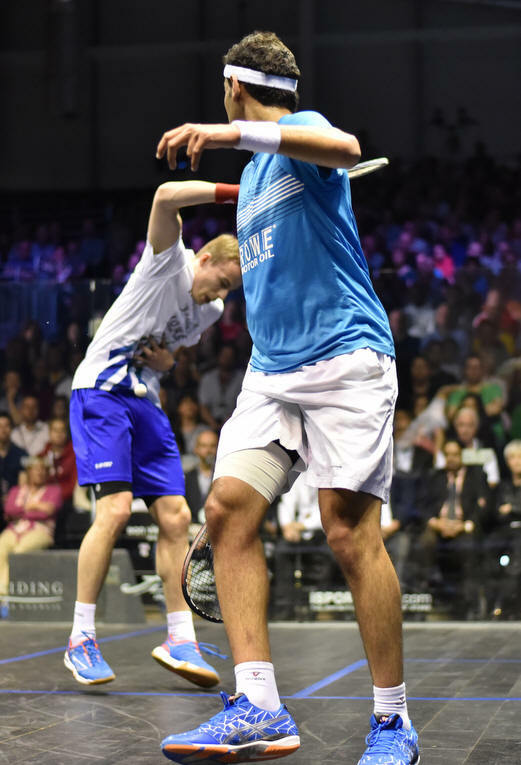 But Mohamed, he was so was delighted to get to his first ever British Open final against…. Disappointing way to end the season but sometimes you have to give both yourself & your opponent credit. Fair play. 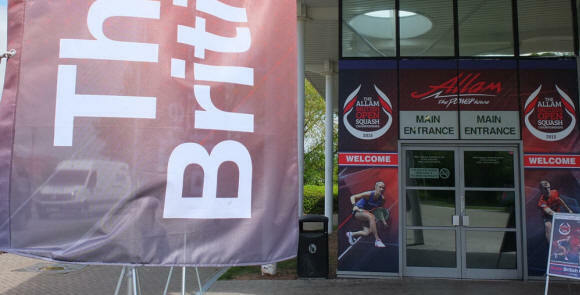 Good luck to the guys&girls in the final tomorrow especially @ljmassaro. 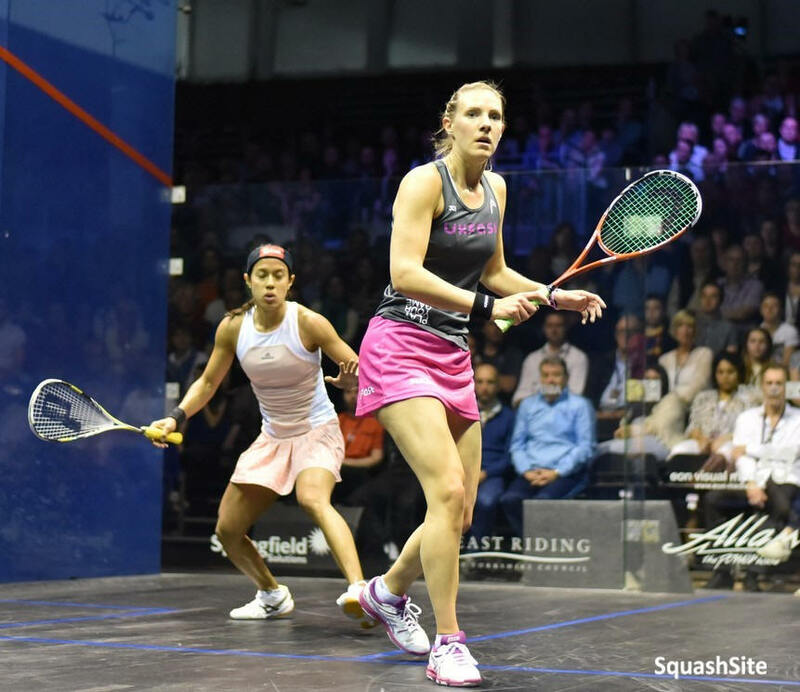 British Open is such a legendary title to win just ask Jahangir! It didn’t come easy though, for the title holder today, as the CanonBall made him work pretty hard for his seat in the final! The first game was crucial, both mentally and physically. 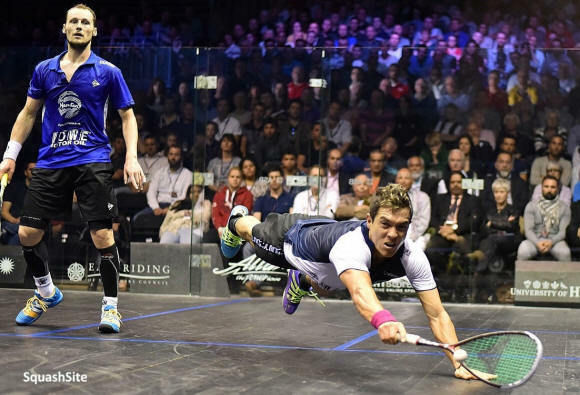 First of all, because Greg is a confidence player, and needs to feel relaxed to play his best squash. And two, because of the length of it, 27m. 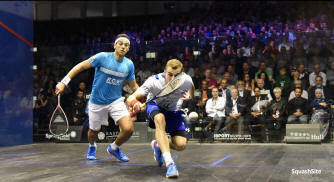 Miguel is one of the fittest players out there, but still, he was bound to feel very heavy legs after losing such a close game, 11/9. 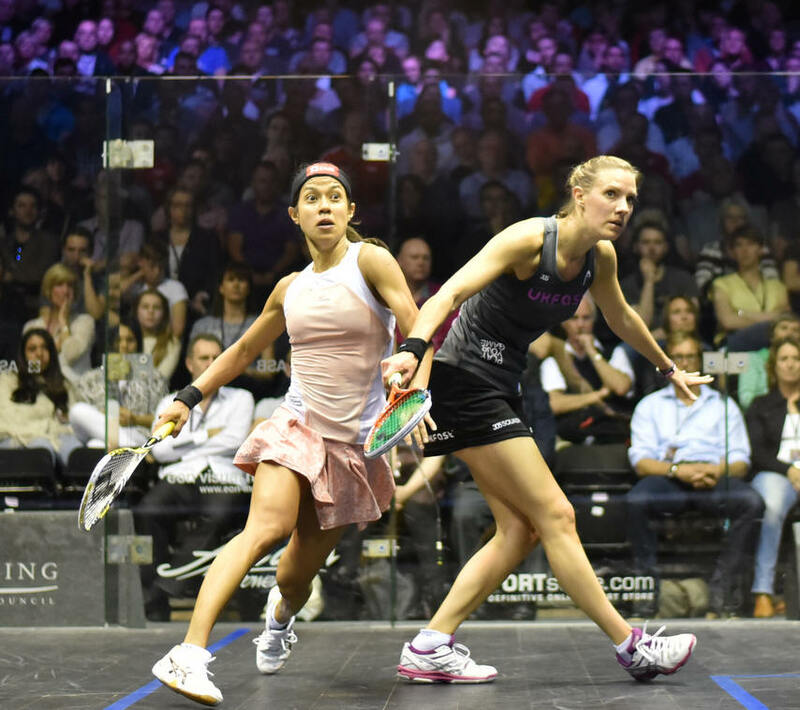 And in the second, the Colombian was not much threat to the Frenchman, 11/3 in 8m. The third, refreshed and willing, Miguel re-attacked with all guns, moving as well as he can, and putting Greg under 16m of heavy pressure. 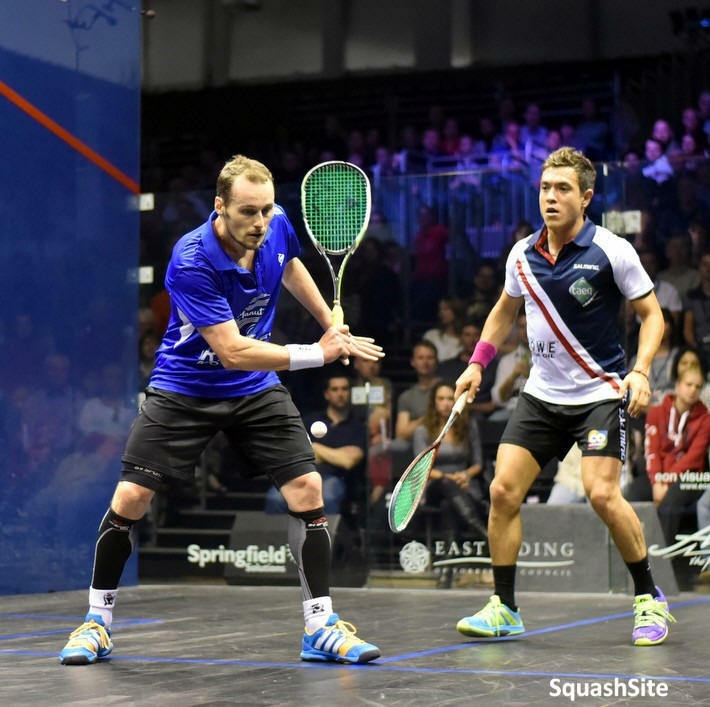 From 4/4, Miguel found some superb energy while Greg found the tin, 7/5, 8/6. 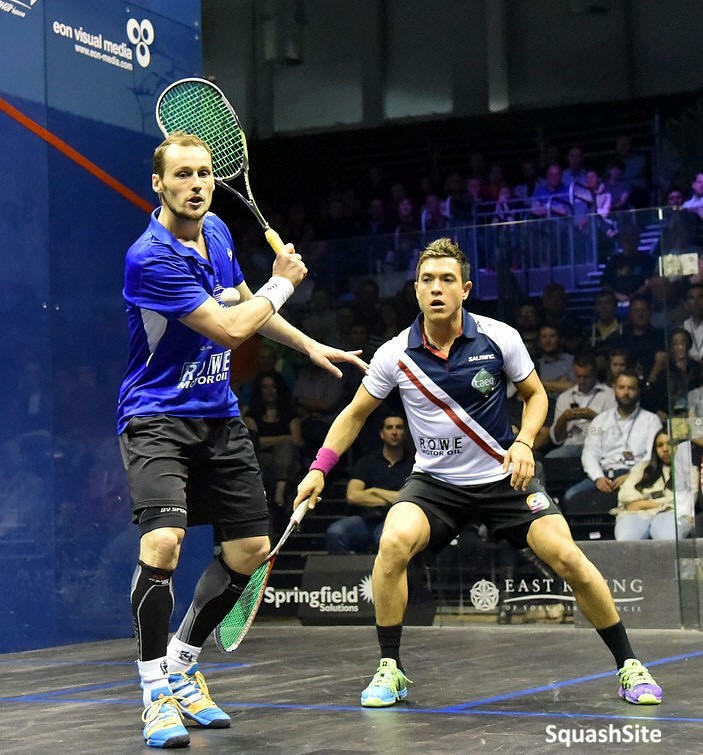 Having no intention of staying on court for a fourth, Greg cut the errors (he made an incredible 14 in all, against 5 for Miguel) and came back in the game, 8/8, 9/9, to finally take it on his second match ball, 11/9. 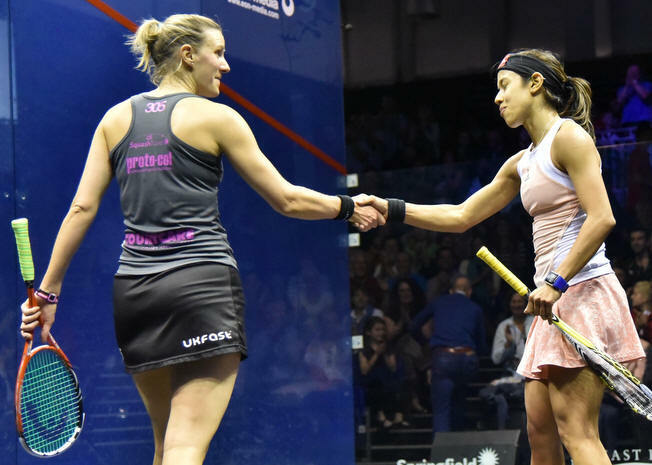 Delighted to be in the final once again, this is my favourite tournament, you know, when you are a kid and you are dreaming of wining a trophy, that was the one for me. I won it twice, but I’m still hungry to take it home. We started the match very fast, but then it slowed down a bit. I was down 6/3 in the first, but I thought that even if I lost it, it was important to make him work very hard, and it paid off in the seconnd. The third was 50/50, but I think I played the crucial points better today. It’s a big bonus to take all your matches 3/0, and I arrive in the final as fresh as I can be, although I was always on the late shift, and had the least recovery time. 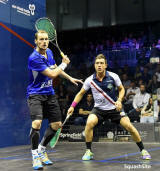 Today, we played at 5, that’s better, so I’ll be ok tomorrow for the final. 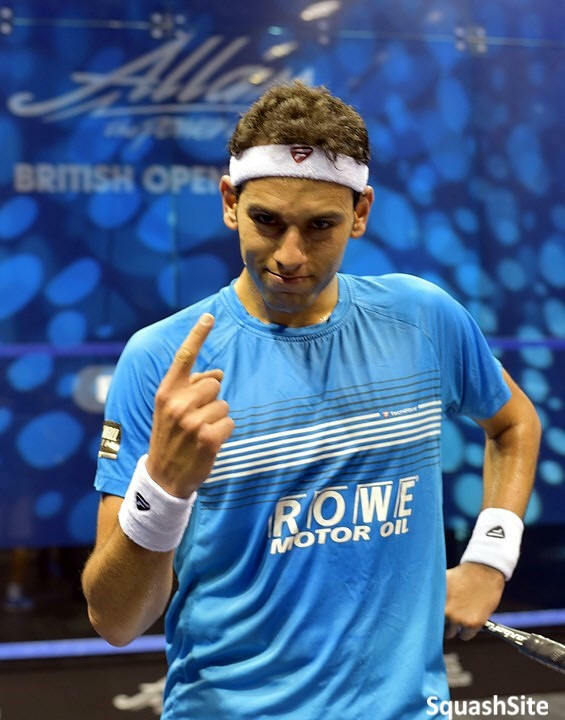 Tomorrow, Mohamed, he is the world number one, he took my number one spot last year. He is a fantastic player, he is playing very well, I’m happy for him and he is a good friend too. But tomorrow, it’s match time, and he beat me the last times we played, so I would love to take my revenge. I’m going to give my 200% to try and lift that trophy once again, and finish the season which hasn’t been that great for me on a positive note.